Poor impulse control, drug use and risky sexual behaviors in teenagers can be the result of weakness in working memory, according to a pair of studies by Atika Khurana, a faculty member in the University of Oregon's College of Education. Working memory refers to processes in the brain that allow people to temporarily store, organize and manipulate mental information. It is especially important when evaluating consequences of decisions and maintaining task focus. 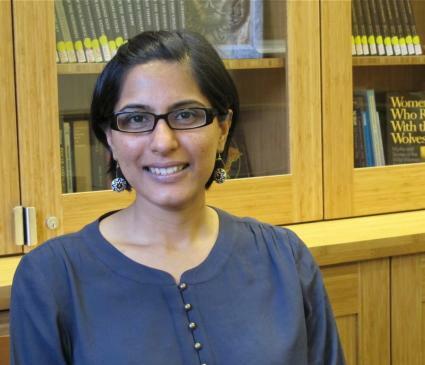 Khurana was the lead author of two studies published last fall based on the work she completed as a postdoctoral fellow at the Annenberg Public Policy Center of the University of Pennsylvania. She joined the UO last July as an assistant professor in the Department of Counseling Psychology and Human Services, and research scientist at the Child and Family Center. Her first study on working memory, published in the journal Addiction, found that individual differences in those brain processes could predict an early onset of alcohol use and progressive drinking behavior among the 10- to 12-year-old children tracked in the study for four years. Previous research had suggested a reverse order in which alcohol or drug use negatively impacts working memory. "The study in Addiction looked at an early adolescent sample when there was hardly any drug use," she says. "Therefore, the weakness in working memory was not due to the drug use. These impairments were present prior to the onset of drug use. "A consistent finding of my research is that individual difference in working memory at baseline can predict trajectories of risk-taking behaviors such as alcohol use and sexual activity during adolescence," Khurana says. "All of that effect is being channeled through impulsivity. If you have low working memory, you will have difficulties controlling your impulses and will be more prone to engaging in health compromising behaviors." Her second study, published in Prevention Science, looked at the use of coping strategies in a nationally representative sample of 710 youths, ages 14-23, in the face of interpersonal stressors. Boys who relied on keeping their emotions under control experienced lower stress and reduced levels of hopelessness and suicidal thoughts a year later. Girls, who more often sought external social support, reported only reductions in suicidal thoughts. Khurana will begin a new project this year, using the UO's new magnetic resonance imaging (MRI) equipment in the Robert and Beverly Lewis Center for Neuroimaging, located in the Lewis Integrative Science Building. Using functional MRI, she will assess aspects of cognitive functioning and self-regulation before and after participants engage in interventions designed to improve self-control. Her goal is to understand how working memory and other interventions that target self-control influence the underlying neural circuitry, and whether those interventions are effective in reducing adolescent risk-taking behaviors. Khurana earned her doctorate from The Ohio State University, where her dissertation focused on maternal and neighborhood influences on adolescent risky sexual behaviors. She was a postdoctoral fellow for two years at the University of Pennsylvania before arriving at the UO.